This is one of the most amazing products I have ever seen or heard of. I know you can't read this scan, so let me describe it. It's a full-page ad from PAGE 17 of the Sharper Image catalog issued in late September of 2003. 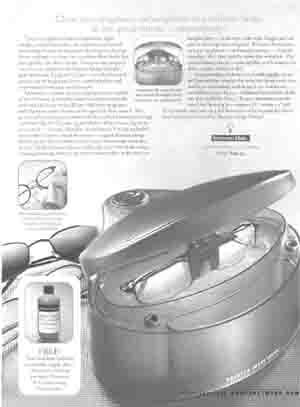 The product is called an Automatic Eyeglass Cleaner. Clean your eyeglasses and sunglasses to a brilliant clarity in one quick minute -- automatically! The main illustration in the lower right shows the product with a pair of spectacles in it. Let's compare my method -- the old method -- to the Sharper Image Method of cleaning glasses. Below, according to the text in the ad, is what I should be doing to my eyeglasses (and sunglasses!). Before this product came on the market, here are the steps I had to go through to clean my eyeglasses. Go to where the product is. Remove the cap from the FREE! bottle of the exclusive Cleaning & Conditioning Concentrate. Measure out two capfuls of the exclusive FREE! Cleaning & Conditioning Concentrate into the tank. Replace the cap on the bottle of the exclusive FREE! Cleaning & Conditioning Concentrate. Add water exactly up to the fill line of the tank. Fold my eyeglasses (or sunglasses!). Clip them to the bottom of the open lid. Wait 40 seconds while my glasses are cleaned automatically. Note that the cleaning is fully automatic, meaning once I've pushed that button I don't have to do another thing (except stand around for 40 seconds)! As I see it, this is surely one of the most amazing features of this amazing product. The lid then opens automatically. This feature alone will result in a dramatic saving of my time, because I won't have to open that lid myself. Let me repeat that in case you didn't get it: The lid opens automatically! Unclip my glasses (or sunglasses!) from the bottom of the now-open lid. Then -- and this is the best part -- the last step is to wipe 'em. Wipe 'em on my shirt. Below is a table further comparing the Sharper Image method to the old method.